Apple Appliance Service provides appliance repair, appliance service, and appliance installation to most major brands of appliances in Calgary, Alberta and the surounding area. The web server used by Calgaryappliancerepair.ca is located in Burlington, USA and is run by The Endurance International Group. There are many websites run by this web server. The operator uses this server for many hosting clients. In total there are at least 16,122 websites on this server. The language of these websites is mostly english. 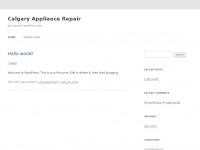 A Apache server hosts the websites of Calgaryappliancerepair.ca. The website uses the latest markup standard HTML 5. The website does not specify details about the inclusion of its content in search engines. For this reason the content will be included by search engines. The visitors are redirected to the homepage of the website "/index.html".